boo! did we scare you? we were down in houston the past weekend taking a look at some fresh new fabrics coming to market. while there, we got permission to snap a picture of the alexander henry booth. 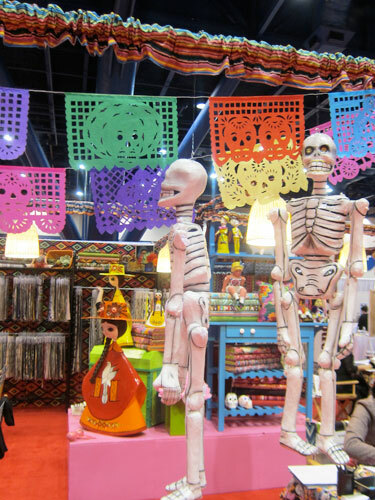 it’s festooned in brightly colored día de los muertos skull and skeleton motifs. we’re told the booth itself took top honors at the event. we got a real kick out of that just right blend of convivial festivity and macabre, and of course, we had a place an order for some of these fabrics! they’ll be rolling into our shop over the next few months . . . look out for updates! UPDATE 11/17/11: the first batch of alexander henry fabrics is in! we’ve got calaveras and some divine cotton lawns (a william morris inspired martine, an eton butterfly) in the house! the alexander henry collection can be found in our shop here.